It's been a while since I've blogged. I've thought about it a lot, I've taken a lot of pictures and eaten a lot of food, but somehow it was never enough to get me to upload the pictures, edit them, and then wax poetic about a meal on here. Firstly, I blame Instagram. It's just too easy to post pictures on there, and all I need is my iPhone, not my DSLR. To me, pictures are the most important part of food blogs anyways (I use most as a photographic restaurant menu, is that okay?) and Instagram provides more than enough food pictures. Secondly, it seems as though all the meals I've had are either unimpressive or too complicated for me to want to write about it. Then I had a meal that was so pretty and so tasty I had to share. 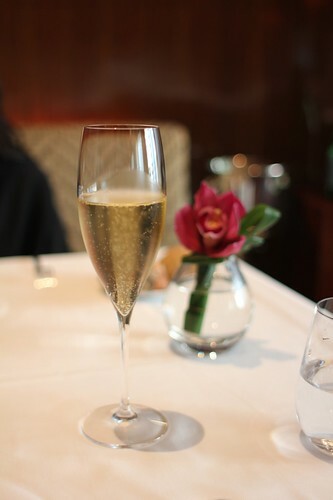 I'm not gonna write much--if you want a background on the history of the restaurant and the chef, I'm sure you can google it and find that information somewhere else. 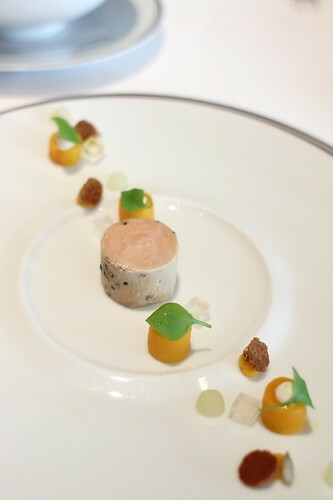 I just want to share the beauty of the meal, the essence of my experience and how I felt while I ate there. First impressions count and that glorious ceiling left me breathless. The second I turned into the dining room, I saw this impressive ceiling sculpture. 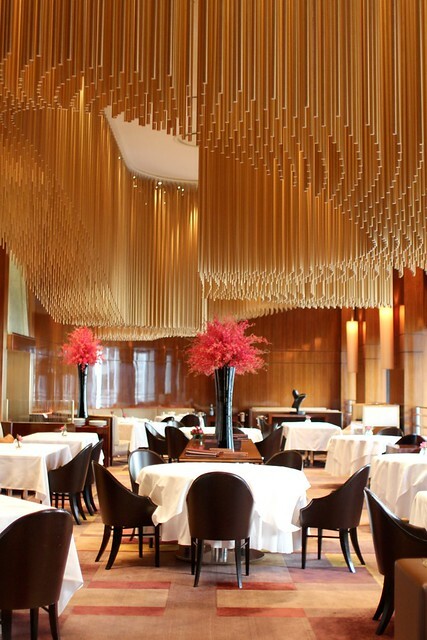 The rods, protruding in varying lengths from the high ceiling, were arranged in a flowing fashion that added movement to the majestic dining room. Though I will admit, looking up and seeing the ends of thousands of bronze rods hanging right above my head was a touch unsettling. Regardless, it really is quite stunning. 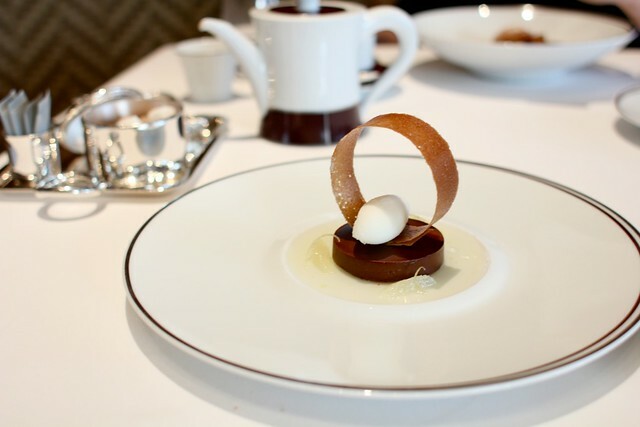 The second most impressive aspect of my meal at Amber was the service. 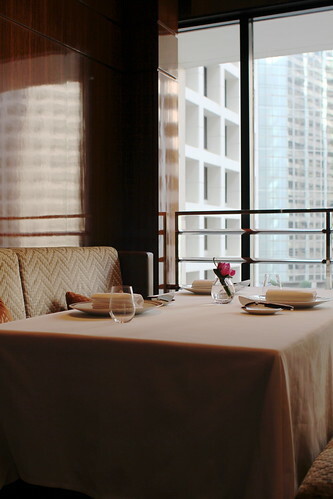 It's the tablecloth-ironed-stemware-spotless-perfectly-paced-synchronized-dish-unveiling kind of service. The kind of service where the front of the house is just as excited as you about the food being served, where questions about the food are welcomed and gladly answered in detail. 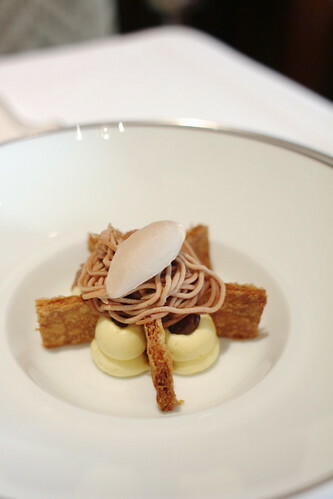 Lastly, the beauty of the food that arrived on our table at Amber really took my breath away. The colors were so bright, the compositions so tight and neat, dainty but not precious--just such beautiful plates. Since we started our lunch too late to indulge in the dégustation menu, we ordered two different sets of the lunch menu and shared everything, resulting in 8 different courses total. Though unintentional, I think that ended up being the best way to order. 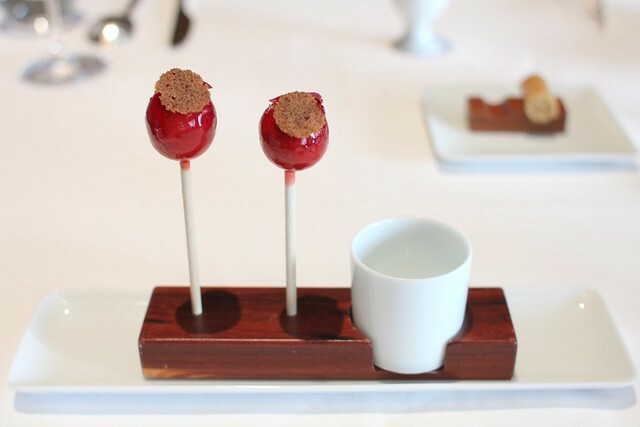 Our appetizer courses came in sets of two, for a total of four dishes, each one as delicious as the last. 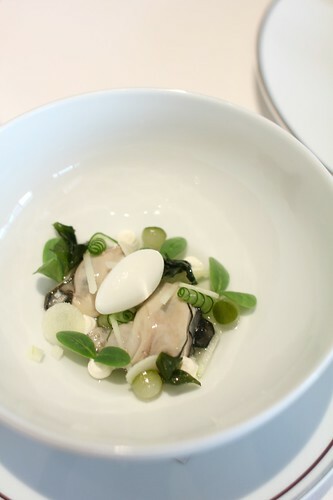 We started with the oyster dish, a dish that was perhaps more visually stunning than anything else. The different shades of green really excited me, and I took more pictures of this dish than I care to admit. Flavor-wise it was a very clean and bright dish, with oysters that weren't aggressively briny. The cucumber jell-O and apple sorbet were appropriately subtle yet refreshing. I've come to realize I love cold preparations of foie gras much more than their hot, seared counterparts, and this version was spot-on. 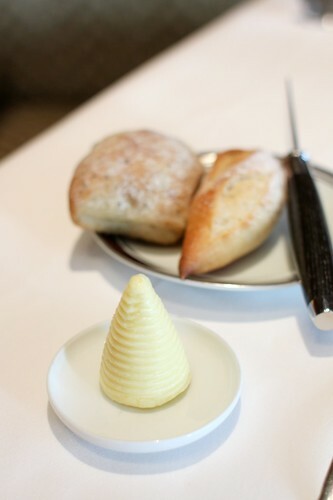 Dense, and solidly creamy, it melted just a touch when smeared on the accompanying hot, buttery brioche. Too good. 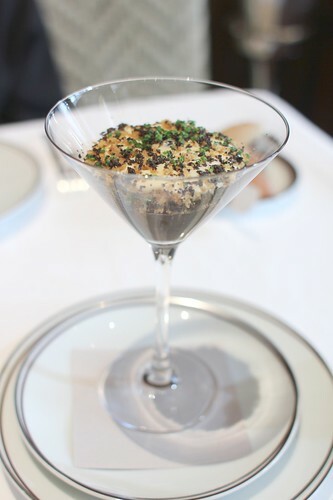 The second set of appetizers started with a 63 degree poached egg served in a martini glass. This was expectedly rich and luxurious, with crunchy bits of buttery croutons and chicken skin. Delicious, but I'll be honest, while I was spooning this in my mouth, I was still thinking about the oyster dish. I'm never too excited when I see salmon on a menu, so the fact that a salmon dish was my favorite course that day really came as a surprise. I realize salmon confit is nothing new, but maybe it was the cut of salmon, its accompaniments, or something, that made it unlike any salmon dish I've ever had. It was cold, with a texture that I can only describe as a cross between salmon sashimi and lightly poached salmon, but it was neither. 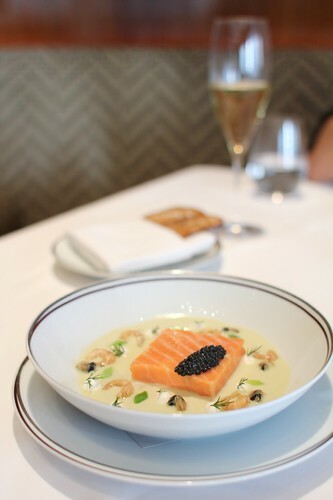 The quenelle of caviar added little pops of saltiness as expected, but the tiny grey shrimp and periwinkles were such powerful bits of ocean-y sweetness, it was eye-opening. The main courses were just as impressive as the appetizers--not an easy feat. It's been a while since I'd had John Dory fish. Upon seeing it on the menu, I vaguely remember my dad saying it's one of his favorite fish to order at a restaurant. What I didn't remember, was the amazing texture of this fish--firm, dense and sweet, slightly translucent in color, and with each gentle nudge of a fork, large pieces would flake off. 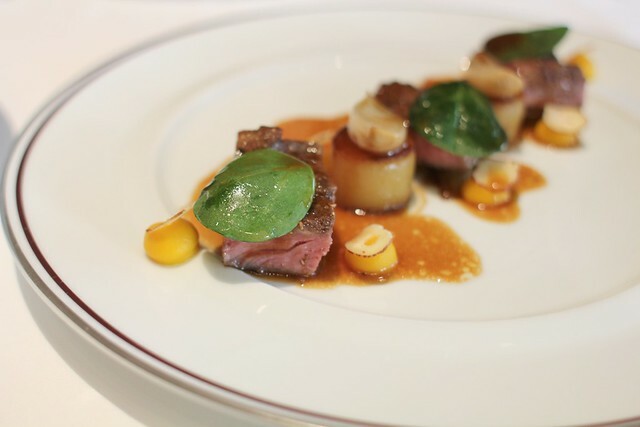 A layer of purée prawns was cooked on top of the filet, adding another dimension of sweet, snappy textures. 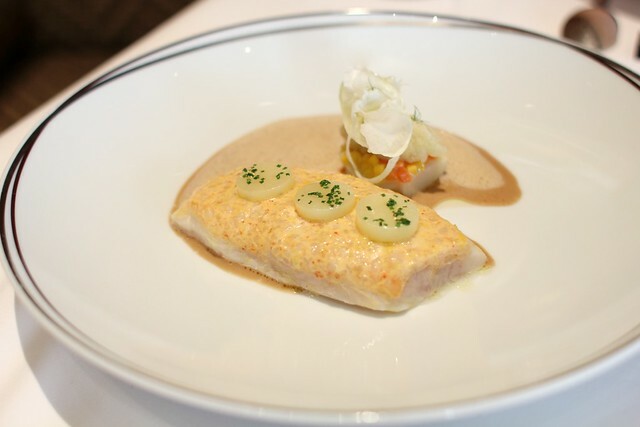 Combined with the prawn/lobster bisque sauce, the whole dish tasted more crustacean than fish. The pork dish was also fantastic, the meat tasting more rich and flavorful than you'd imagine pork to be. However, my heart belonged to John Dory. 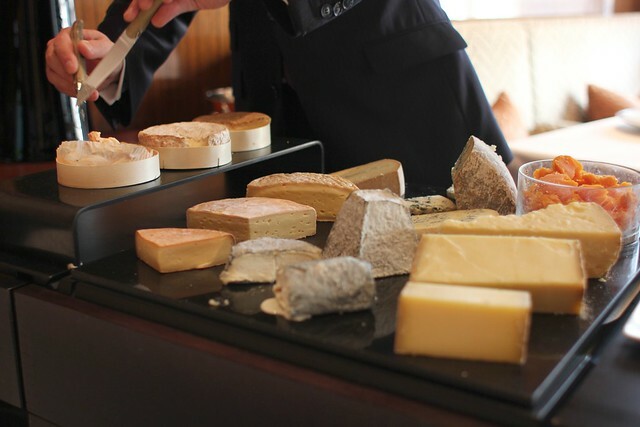 I can't remember the last time I saw such a beautiful cheese cart, and I may have made some embarrassing squeal-like noise when restaurant manager Sébastien Noyelle rolled it over. I made another excited expression/noise when he said "époisse" while naming all the cheeses, to which he made an psuedo-exasperated French face and asked, "why does everyone like époisse?" Really, I think the better question is, "who doesn't like époisse?" 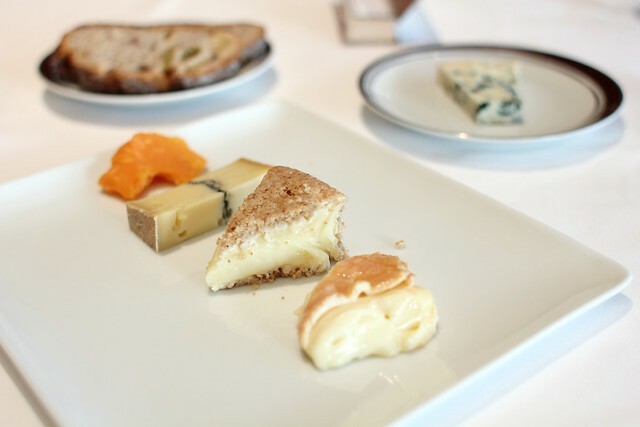 ;) I ended up with a plate of mimolette, morbier, camembert au calvados, epoisse, and some kind of blue cheese that made me more than happy--so happy that I barely needed the following desserts. 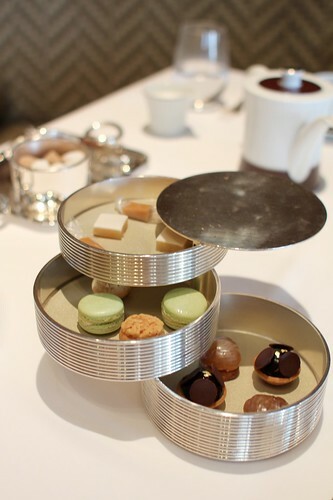 We took the mignardises home in a beautiful "Amber" takeaway box that they must've designed for this specific situation. They survived the flight, and I enjoyed them the next day back home in Taipei while reminiscing about the meal. I realize that at the beginning of this post, I said I wouldn't write much, but I couldn't help it. I just remembered why I used to love blogging so much. It gives me a chance to relive a meal, and this meal was too good for me not to relive to its fullest, wordy, extent. I've recently acquired a very important life skill. I can now shuck oysters. 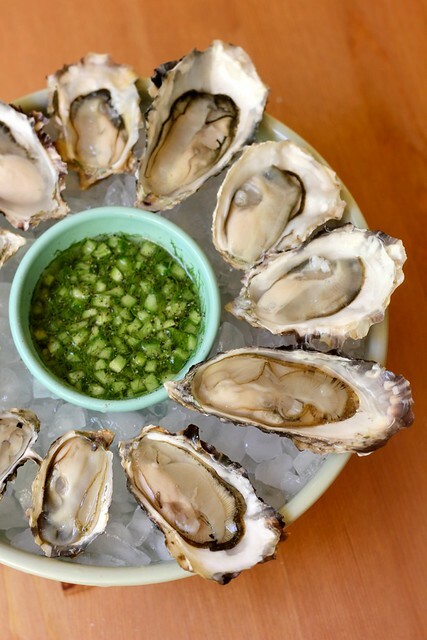 All it took was a dozen Luna oysters and a quick, under-a-minute, tutorial from the two Frenchmen manning the Carlsbad Aquafarm booth at the Santa Monica Farmers' Market for me to become a master oyster shucker. Before I embarked on my oyster shucking adventure, I wondered whether strength or skill would be more essential to my success. In most of life's situations, I would say skill is more important than brute strength. In oyster shucking, I have to give strength a slight advantage. 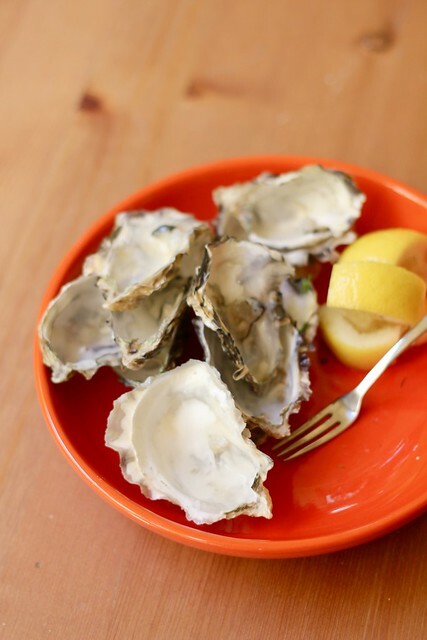 I can only shuck about a dozen before I have take a break, eat the dozen oysters, and then shuck some more oysters. That being said, it's skill and a thick kitchen towel, rather than strength, that will save you from stabbing through your palm with an oyster knife. First, hold the oyster between a folded kitchen towel, cup side down, flat side up. The trick is to get the tip of the knife into the "hinge" or little crevice at the narrow end of the oyster (dirty?). Being the wimp that I am, I have to really work to get the knife through the shell. I do this by twisting and wiggling the knife left and right as if it were a drill. 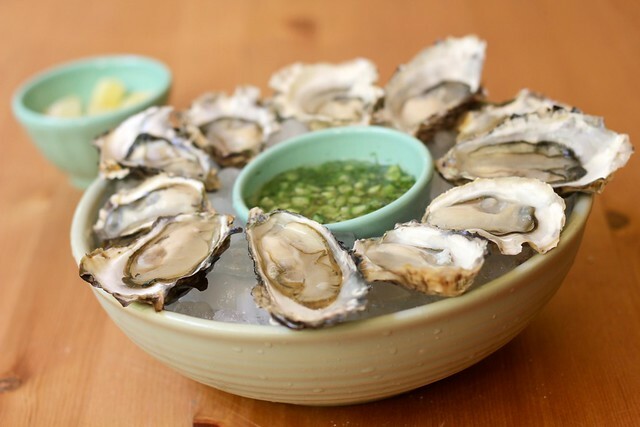 Once you're in, you'll realize that the poor oyster's adductor muscles are still trying to hold its shells together. Lift the flat shell up and scrap the muscle off with the knife. Run your knife under the now exposed oyster flesh and loosen the other adductor muscle attached to the curved shell. Try not to lose too much of the briny liquor. These are the only tricks I have to offer. If you don't have oystermen at your local farmers' market, take a look at this video. It's not the most exciting video and there's no French accent, but it will do. I meant to take pictures of this process, I really did, but it's impossible to shuck an oyster while simultaneously working a camera. Oyster shucking is a two-handed job. 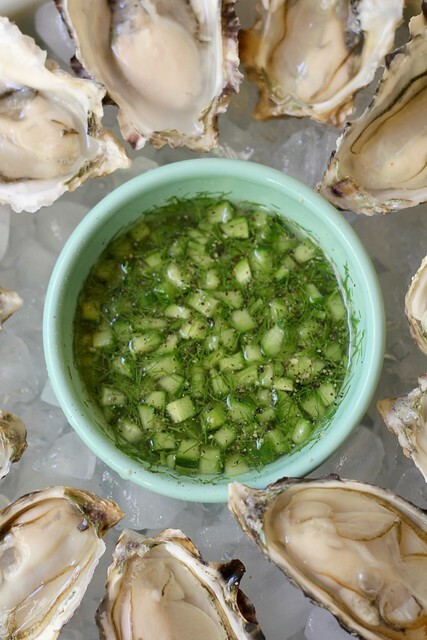 I like my oysters with a simple squeeze of lemon, but since I always get a slight hint of cucumber from Luna oysters, I thought a cucumber fennel mignonette could be fun. Why fennel? Because I am STILL obsessed with fennel. Cut the cucumber in half, lengthwise, and scrape out the seeds/pulp with a small spoon. Do a nice, fine dice on the cucumber, chop up some fennel fronds, and combine with the rice wine vinegar, sugar, and pepper. 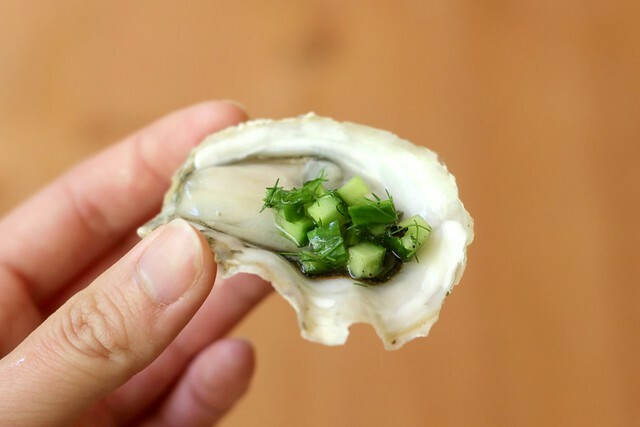 Prepare this before you start shucking oysters and by the time you're done, the all the ingredients in the mignonette will have become good friends. To enjoy my beautifully shucked oysters, I've been arranging them on my new pasta bowl and salad plates from Bauer Pottery. 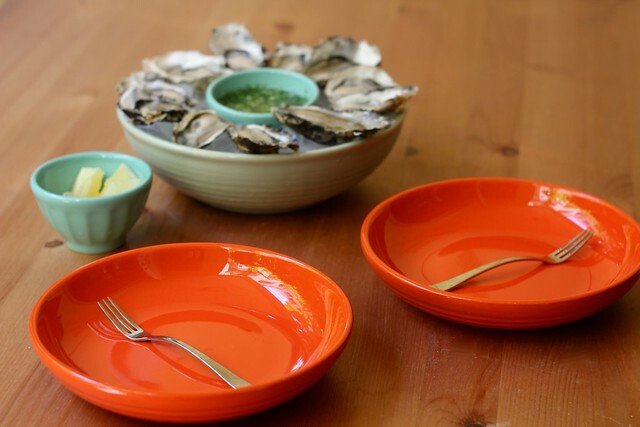 Though not holding what they were intended for, the bowl is the perfect size for a bed of crushed ice and a dozen oysters, and the salad plates in the signature "Bauer Orange" add such a nice splash of color. 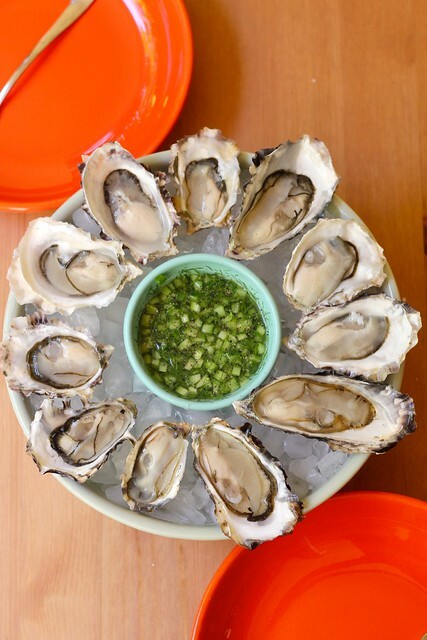 The servingwares' bright colors and shapes are inspired by a Californian lifestyle, and if a summer of freshly shucked oysters from the Santa Monica Farmers' Market, enjoyed on my patio in beautiful weather doesn't scream California, I don't know what does. Thus, my current Saturday morning ritual involves visiting the farmers' market, picking up a pint of Gaviota strawberries from Harry's Berries and a $10 bag of a dozen Luna oysters from the Carlsbad Aquafarm. I come home, shuck my oysters, invite a friend if I'm in a sharing mood, and happily slurp oysters to my heart's content. If you love oysters, but have never shucked an oyster, it's time you get over your inhibitions and just do it. It's done wonders for my Saturdays and my oyster addiction. I've even started blogging again. Dumpling making should be a group effort. In our family, this is the usual division of labor: I chop the veggies, my brother mixes the filling, my dad and I form the dumplings, and my mom cooks them before we all devour them. For whatever reason, I recently thought it would be a good idea to attempt this entire process by myself. Sure it was a little lonely and made me wish the rest of my family was sitting at the table with me, but it was actually pretty easy for one person to do. 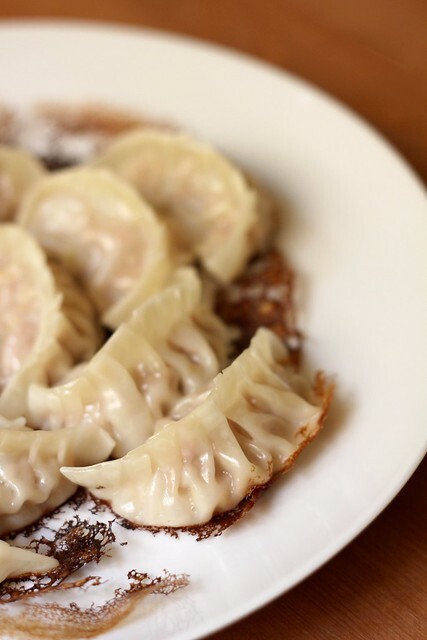 And to be honest, a Sunday afternoon with the Charlie Parker Pandora station, a stack of dumpling skins, and a tray waiting to be filled with dumplings is my definition of relaxation anyways. In Taiwan we get the most amazingly "Q" dumpling wrappers from a local street market to make jaozi (餃子). The dough is still soft and pliant, capable of stretching itself to contain a bellyful of pork filling. The skin, therefore, molds perfectly to the filling even as it is boiling, holding in all the porky juiciness. Really, my mouth is watering even as I write this. Unfortunately, I don't believe this kind of wrapper can be found here in LA. And as much as I enjoy repetitive actions, there's also absolutely no way I would sit here and roll out 80 individual pieces of dough myself. My solution was to make Japanese gyoza dumplings instead. In my mind, the gyoza skins didn't matter at much as long as they were thin and slightly chewy. A trip to the local Nijiya Japanese market resulted in a stack of frozen gyoza skins straight from Japan and some beautifully fatty ground pork. Here is where I warn against making dumplings with subpar meat. If you can't find gorgeous looking ground pork, just don't do it. It won't be worth your time. We tend to think the simpler the filling the better, but that also means there's nothing to cover up less than pristine pork. When we make dumplings in Taiwan, we use kurobuta pork, or 黑毛豬. 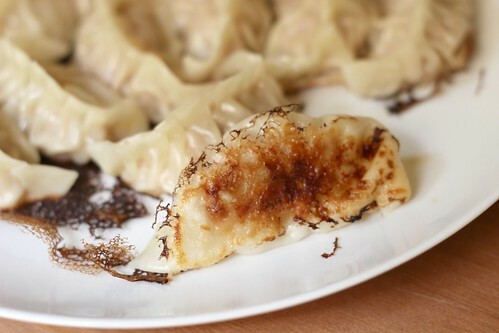 So here is my tester recipe for yaki-gyoza, or Japanese pan-fried dumplings. Incredibly authentic? Not sure, but it was quite tasty. I was surprisingly happy with the results, though I will say that the recipe can benefit from some more tweaking. Next time I will experiment with adding chives, some grated garlic, and a little more grated ginger. If it is tastier, I will add an update to the end of this post! Cut a head of napa cabbage in half, lengthwise. Core the two sides and rinse each leaf separately. In the bottom of a colander, lay down a layer of the dried cabbage leaves. Sprinkle a light, even layer of salt over it before covering the first layer with another layer of leaves. Repeat until the entire head of cabbage has been salted. 20-30 minutes later, a lot of the moisture in the cabbage leaves will have been drawn out. Squeeze the leaves with your hands to get even more of the water out. Finely mince and set aside while you gather the rest of the ingredients. In a bowl, mix together the ground pork, soy sauce, grated ginger, sesame oil, and minced cabbage. Stir together, in one direction only, until well combined. Some recipes would call for salt, but since I salt the napa cabbage leaves pretty thoroughly, I figured that was enough salt. It's also at this point where I would put on a little pot of water to boil, make a little tester ball of filling, and cook it to see where you are on seasoning. Tweak and adjust as you see fit. Cover the bowl with plastic wrap and let it sit in the fridge overnight. This way, all the ingredients get to mingle together and make nice. 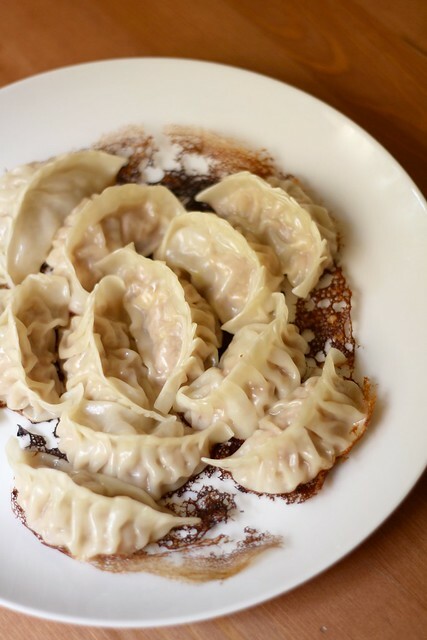 The next day, assemble your filling, gyoza skins, a small bowl of water, and some foil covered baking sheets on the dining table, gather any willing volunteers, put on a movie or some jazzy music, and sit down to start the dumpling making. 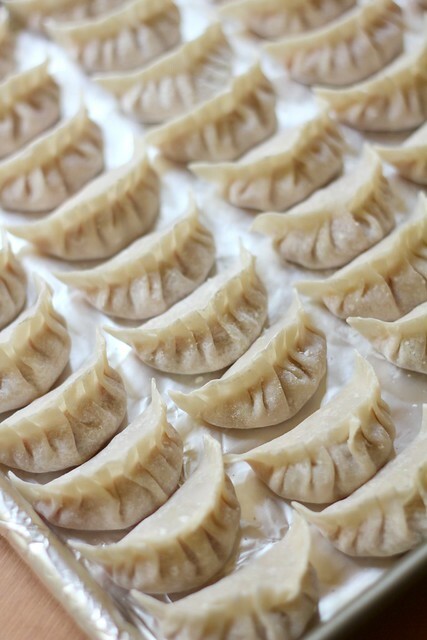 First, put a reasonable amount of filling in the center of the round gyoza skin. Dab a small amount of water all the way around from the edges and pull the two sides together to form a half moon with the filling in the middle. To pleat, I start from the center, pleat to the right, come back to the center, and finish pleating to the left. The OCD side of me finds it incredibly entertaining to try to pleat the same number of pleats in every dumpling, and I usually do at least eight pleats which may already be four too many. Of course, I'd advocate that the appearance of the dumpling is almost just as important as the taste of the dumpling but really, just make sure the filling is well sealed in the skin. Once a tray is filled with freshly pleated dumplings, put it in the freezer. Once it is frozen, the dumplings may be kept in a Ziploc bag to conserve space. To cook, heat some oil in a nonstick pan before adding frozen gyoza straight into the pan. Cook on one side for 4-5 minutes, or until golden brown on the bottom. Then, add just enough water to cover the bottom of the pan and cover with a tight lid until all the water has evaporated. 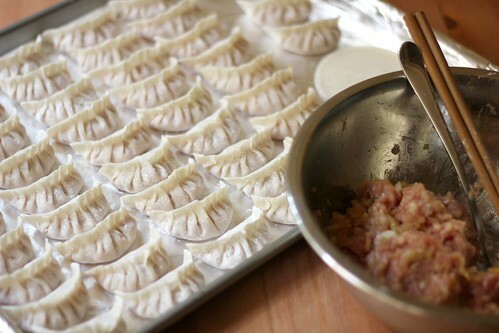 With frozen dumplings, I tend to do this twice--just to make sure the filling is cooked and heated through. After the water as evaporated just cook until the bottom crisps up again. Slide onto a plate and serve with a dipping sauce. Technically, I suppose you should serve them crispy side up, but I think it looks prettier crispy side down. The only downside is that the crispy side gets not so crispy. You be the judge on which matters more. #1: mixture of soy sauce, rice wine vinegar, sugar, and chili oil to taste. So with Chinese New Year's Eve is coming up, I figured this was an appropriate post. 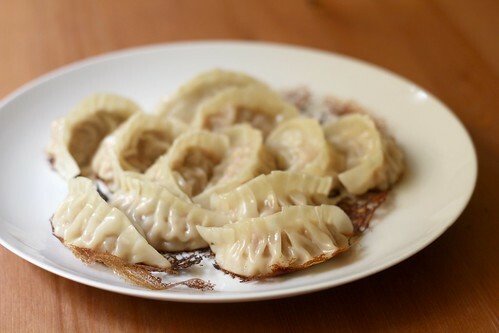 Dumplings are usually something eaten during Chinese New Year since they have the shape of gold ingots, or yuan bao, and are thought to bring prosperity to the new year. Also, since I haven't blogged since god knows when, maybe a post on dumplings would be an auspicious start to a new year of food blogging. Sometimes, the only thing that gets me through the week is a Wednesday morning trip to the Santa Monica farmer's market. I'm not normally an early riser AT ALL, (in fact, sleeping in is probably one of my greatest skills) so waking up early enough to make it to the farmer's market before class is not an easy task for me. However, I can't think of a better reason to get out of a warm bed in the mornings than the prospect of beautiful produce. Maybe this is weird but selecting of the perfect piece of fruit of vegetable really gets my adrenaline going. I can stand in front of a pile of apples, picking and choosing, for longer than I care to admit. Though it's definitely no longer summer, the farmer's market is still overflowing with tomatoes--cute little cherry tomatoes, gnarly heirloom tomatoes, meaty beefsteak tomatoes, you name it. Somehow, even with all these choices, I decided on a basket of bright orange Sungold tomatoes. They turned out to be so perfectly ripe, I could literally peel the skins off like a grape and enjoy a pure, unhindered burst of sweetness from only the flesh. 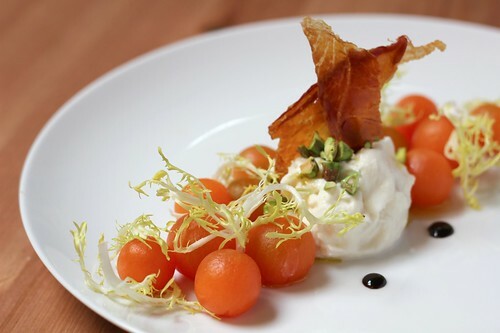 So after a little inspiration from this beautiful food blog and a few little drawings during a particularly un-stimulating economics lecture, I created this little afternoon snack for myself with this week's goodies from the farmer's market--Sungold tomatoes, frisée, pistachios. 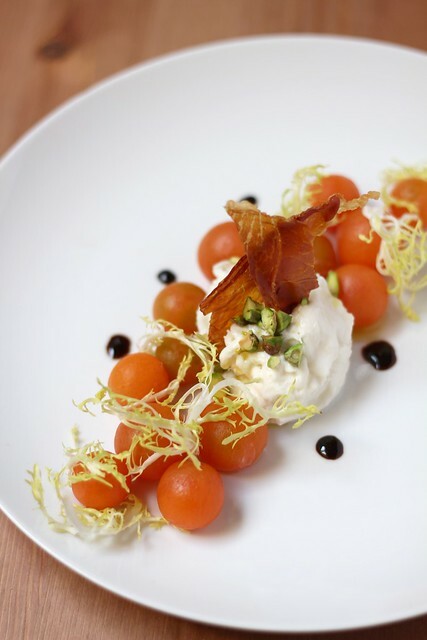 Peel some tomatoes, wash some frisée, shell pistachios, crisp up prosciutto in the oven, reduce balsamic vinegar and honey, plop down a healthy portion of creamy burrata, and finish with a drizzle of extra virgin extra fruity olive oil. Super simple. Barely any cooking involved, but so beautiful to look at.